President Barack Obama bumps his head slightly as he leaves for a trip to Andrews Air Force Base, Md. before making his way to Indiana for a town hall-style event Monday. President Barack Obama showed today that even seemingly unflappable presidents can have awkward moments. 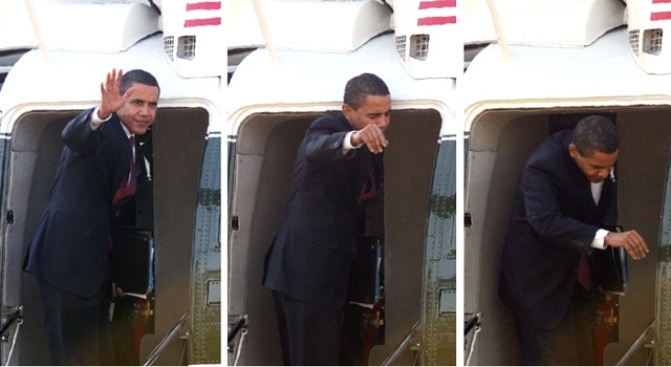 Obama waved to onlookers as he passed through the doorway into Marine One en route to Andrews Air Force Base, Md. earlier today but the 6-foot-1 commander in chief misjudged the door height as he entered the helicopter and bumped his head. Unfortunately for the new president, a row of photographers were on hand to capture the moment. Former president George W. Bush had a similarly embarrassing moment in 2005 when he tried to push past a locked door during a Beijing press conference.